Swaying onboard a ship in the Atlantic Ocean, researchers waited for 8-gallon cylindrical bottles to emerge from beneath the waves. Attached to the ship by a thick cable, the bottles had travelled to the bottom of the ocean then collected seawater at different depths during their ascent. A single teaspoon of this seawater teems with hundreds of thousands of bacteria, tiny decomposers that munch on carbon—the chemical element that all living things are made of. The researchers, based at the universities of North Carolina and New Hampshire, recently found that bacteria communities differ in their abilities to digest carbon molecules. 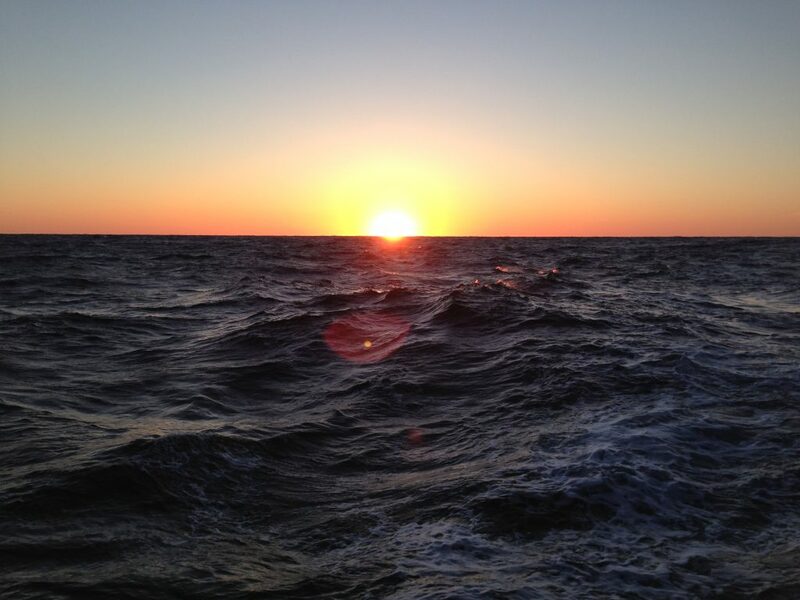 Published in Environmental Microbiology, the findings suggest that changes in bacteria communities, such as from warming ocean temperatures, could also affect carbon consumption in the ocean. Understanding intricacies of ocean carbon cycling is important because it affects the global flow of carbon, which impacts our climate. 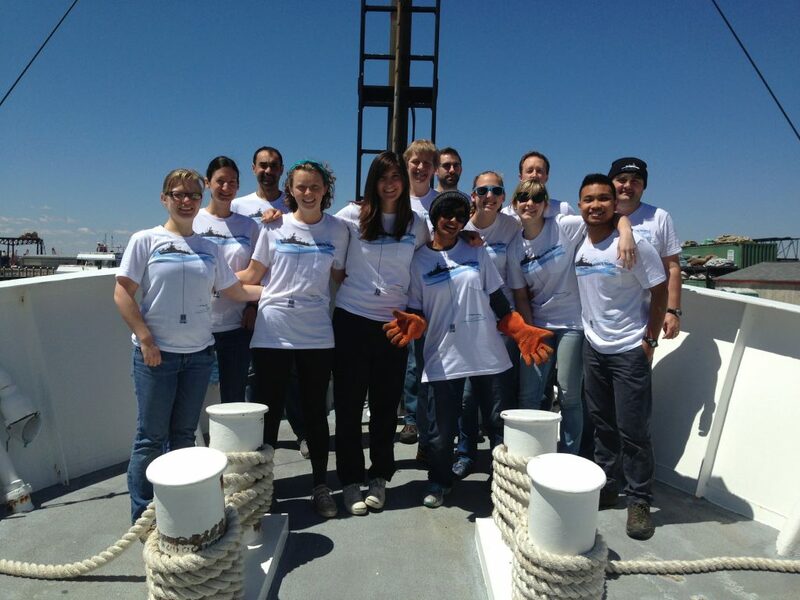 The seafaring research team on the R/V Endeavor. Photo by JP Balmonte. Marine bacteria mostly eat dead algae cells or waste excreted by algae, which contain carbon and other nutrients. Bacteria incorporate this carbon or release it as carbon dioxide, the same gas we exhale. As key players in the carbon assembly line, bacteria influence how much carbon remains in the ocean and how much is recycled back to the atmosphere. Similar to how we chew our food, bacteria must break down relatively large carbon molecules before consuming them. Like our specialized canines and molars, bacteria use an arsenal of specialized molecular machines called enzymes to chop up different algae-derived carbon molecules, like carbohydrates and proteins. Not all bacteria can make each enzyme though, giving some an advantage depending on what’s on the menu. Since a variety of different bacteria live together in a community, the researchers wondered if a community’s ability to digest large carbon molecules depended on the specific bacteria it contained. Alternatively, since a community includes a mixture of enzymes from many bacteria, different communities might have the same collective digestive powers regardless of which bacteria they contain. 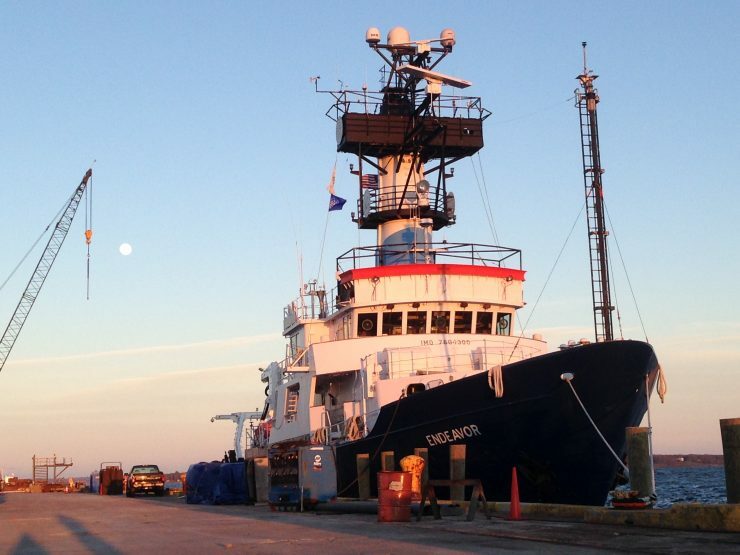 The seafaring researchers collected bacteria communities at two locations in the Atlantic from both the bottom and surface of the ocean. They stored the four seawater sources in 5-gallon containers and added dried algae puree to represent large food molecules. “It looked like fish flakes,” remarked the study’s lead author John Paul Balmonte, formerly of UNC and now at Uppsala University. For comparison, they also deprived the same seawater sources of food, so they would know what happened to communities simply because of confining them to a container. If a community’s ability to digest the algae depended on which bacteria it contained, the researchers predicted that community proportions would change as better-equipped bacteria capitalized on the food. If communities already had the collective enzymes necessary to digest the algae puree, researchers expected communities to stay the same. Over two months, the team busily monitored the bacteria and measured their various enzymes. Researchers extracted and sequenced DNA to identify different types of bacteria. To find out which enzymes bacteria produced, researchers added over a dozen synthetic carbon molecules into water samples to see which were nibbled on, like fish bait. Bacteria communities changed after being served the algae puree, compared to communities that didn’t receive extra helpings. Bacteria that were initially rare began to dominate communities that received food, likely because they could break down large carbon molecules while others could not. As bacteria communities changed, more enzymes also became busier. Despite these similar overall trends in community changes, specific changes differed based on seawater source. The exact types of dominant bacteria, and time they began dominating, depended on the water source. Dominant bacteria from different water sources were closely related to each other, though, demonstrating that only a specialized subset of bacteria could digest large carbon molecules. The specific types of molecules their enzymes shredded, and their speed of doing so, also differed across water sources, meaning that each community had unique strategies for breaking down the food. These community and enzyme changes led to the conclusion that bacteria community differences do affect how large carbon molecules are digested. 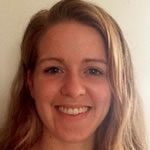 Communities could not efficiently break down the food with their existing enzyme mixtures, so more capable bacteria took over as “first responders,” as Balmonte refers to them. Potential future changes in bacteria communities could affect which large carbon molecules are consumed and how quickly. These changes in carbon flow can impact larger organisms up the food chain and can alter the amount of carbon entering the atmosphere, which ultimately affects our planet’s climate. Top image: Researchers traveled onboard the R/V Endeavor to collect seawater at multiple locations and depths in the Atlantic Ocean. Photo by JP Balmonte.